So today was another big day with the ongoing landscaping projects. Remember my friend Alex whose wife sewed me my quilted pillow? Well he and I are both Presbyterian ministers, so after spending the better part of the day conducting Presbytery business decently and in order, we got indecent and disorderly with the last remaining shrubs in my front yard. Alex is a pro with the old chainsaw, so he finished trimming up a few tree-like shrubs (they are evergreens of some sort–no idea what variety/species) which I’m leaving at the corners of the house to help “anchor” the facade. 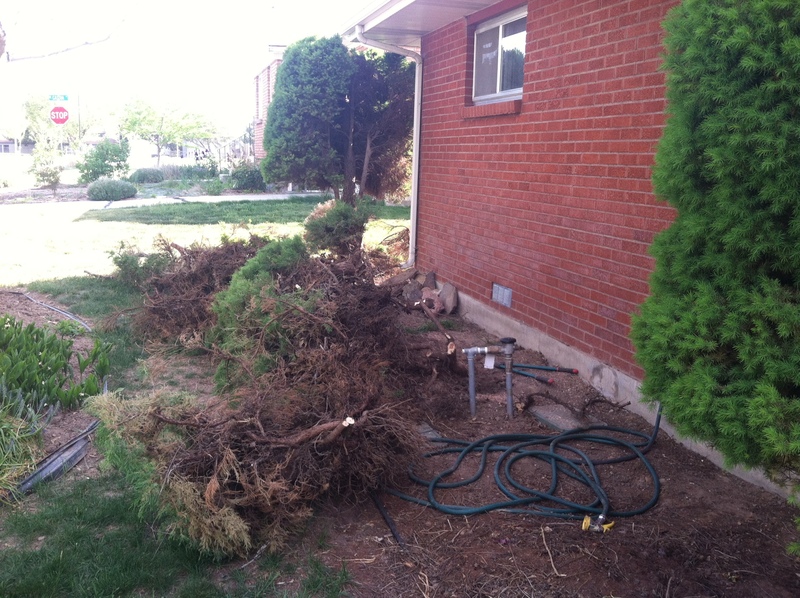 He also finished pruning my cherry tree and cut out the final three shrubs that I wanted completely removed. You can finally see the majority of my house–and it’s looking good! 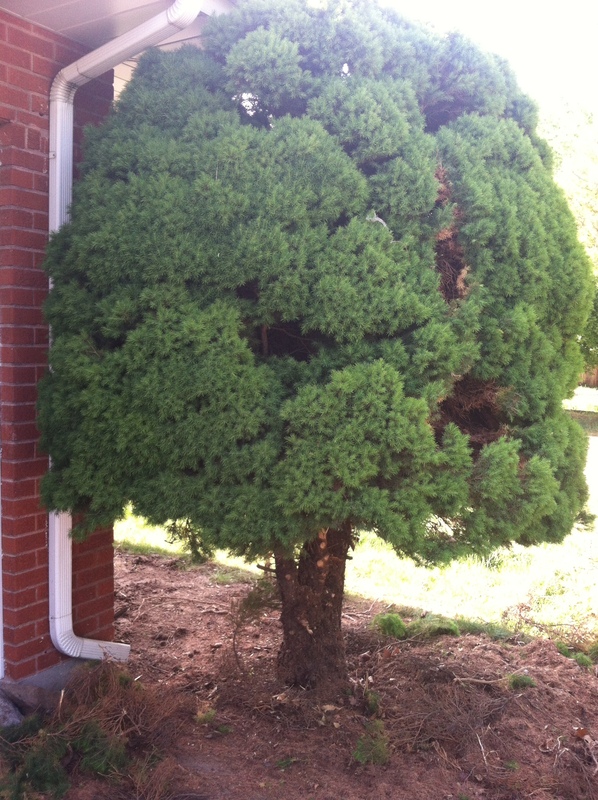 Hopefully when I eventually can park my car in my garage, this shrub won’t scratch the side now that it’s been trimmed. I might still have to run the electric hedge trimmer over it a bit. It is sooooooo helpful having someone do all that work using a chainsaw. It would have taken me much longer to do all that by hand with nippers or a handsaw, so I’m sooo grateful for all the time he has taken to help me whack away at my jungle of a yard. 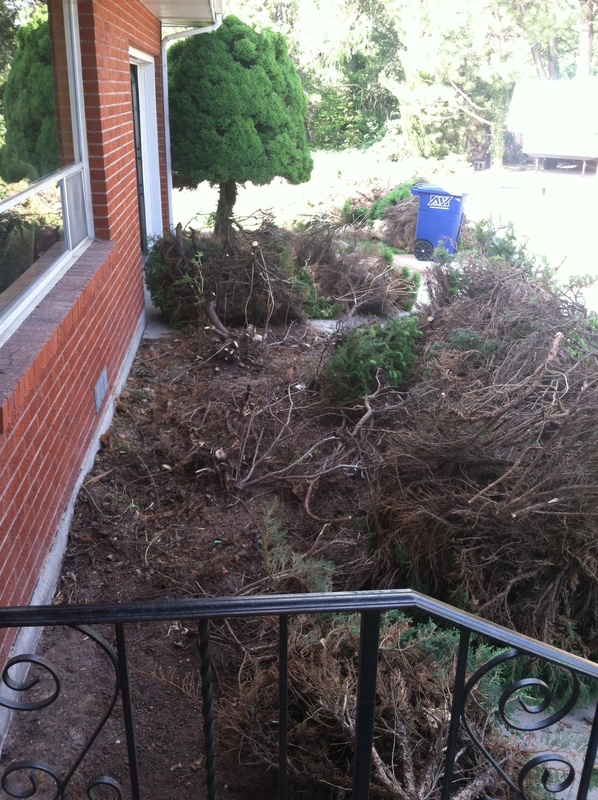 (Wait til you get an update on the back hedge… Does anyone hear “Welcome to the Jungle” playing in the background…???) When I had just moved in, back in February, one day I was finishing my work in the afternoon, and a landscape guy pulled up and parked on my curb. He knocked on the door and asked if I needed any help with my landscaping. I quickly realized that in the down season, he was trolling the neighborhoods looking for jobs. I’m not sure if I should have been offended that he stopped at my house–cleeeeeeeeearly my landscaping needed some serious work–but it was actually nice to chat with him for a few minutes. We walked around the yard and I shared with him the ideas I had of what I wanted to trim, take out, replace, etc. After hearing his casual bids for different jobs I wanted done, I realize that all the digging and trimming I’ve done with the help of a few friends has probably saved me about $2000. And Lord knows, I’ve only just gotten started! So tomorrow I’ll have an update on the debris removal process. Another neighbor will be helping me get rid of all the trimmings, which will be it’s own monumental task. But, as Chris Farley would say in Tommy Boy, “I mean, I got time…” And, many friends have volunteered to help in different ways. I’m so grateful for them and my house with a yard and lots of landscape/garden potential.